Gov. 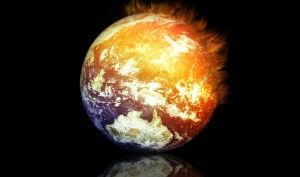 Jerry Brown warned at a recent climate change workshop that trillions of dollars, the transformation of our way of life and a worldwide mobilization on the scale of war will be required to stave off climate change’s “existential threat” to mankind. Brown also said the problem is so complex that it’s likely no one knows how to solve it. The 2030 target reduces California’s greenhouse gas emissions to 40 percent below 1990 levels in the next 15 years. Brown also designated a 2050 target: emission reduction to 80 percent below the 1990 level. The 2030 target is “the most aggressive benchmark enacted by any government in North America to reduce dangerous carbon emissions over the next decade and a half,” said Brown in an April 29 statement. The governor began his remarks at the workshop with an admission of ignorance on climate change science. That complexity makes it easy for climate change skeptics to disseminate misinformation, according to Brown. “It allows people who have bad motives or soft minds to then raise doubts that are not based on science or facts, but are able to be communicated without people reacting with total ridicule,” he said. “And it takes enough knowledge that it’s hard to be in this conversation at any level of depth. Brown acknowledged that the public has thus far been largely indifferent to the climate change issue, ranking it well below crime and jobs among issues they are most concerned about. That indifference or ambivalence may be due to the omnipresence of fossil fuels in the quality of our lives. “What we are looking at is making a shift in the way life shows up,” Brown said. “We are who we are because of oil, coal and natural gas. Fossil fuels is what makes it. I assume that most of the people here are here because fossil fuels got you here, clothed you, medicated or whatever way you are functioning as a modern person, you are dependent on fossil fuels. Brown, citing a Sept. 29 speech by the Governor of the Bank of England Mark Carney, warned there is a potential for a global economic meltdown when energy companies are forbidden from using up to a third of their fossil fuel resources. “Once it becomes conventional wisdom, once we get it that climate change is going to be catastrophic and that becomes clear and vast majorities of people at all levels of society agree with that, it may be too late because we’ll be too far down the road,” he said. Brown said the state’s current annual output of 460 million tons of carbon dioxide-equivalent emissions must be reduced to 431 million tons by 2020 and down to 260 million tons by 2030. It will also require Californians driving a lot less, he said, by living closer to where they work and telecommuting. “Californians drive over 330 billion miles a year – 32 million vehicles of various kinds moving around on almost entirely fossil fuel,” he said. “We’re going to reduce and take fossil fuels out of our lives and out of the economy. In my world of politics this is … a dark reality that you just can’t even talk about. Because it’s too obscure, too complicated, it’s not high in the polls, “don’t bother me now.” But if that mood persists … it will be too late then, and there will be a real catastrophe. People don’t like to think that something horrible could happen. We all like our happy time news in the morning. But you got to see it, and then we have to take steps to make sure it doesn’t happen. This is about taking the steps to deal with fuels, the investment in biofuels, [energy] efficiency in appliances and buildings, across the whole range of how our modern civilization works, within the limited reach that the Air Resources Board has confidence and the legal authority to do, which is quite a lot. Everything that can be done will be done. California will do what it has to do. Brown believes California is setting an example other states and countries will follow. No one at the workshop questioned whether California’s efforts will do much to prevent the planet’s climate from changing, and whether the cost will be worth it. The district I represent is still reeling from the Great Recession and the devastating years-long drought. Too many people in rural and inland communities are impoverished; standing in food lines because they can’t find work to make ends meet. Senate Bill 350 is a devastating measure that will force already-struggling families deeper into poverty by drastically increasing energy costs that are already some of the highest in the nation. The impact on most Californians from the state’s climate change regulations has been minimal thus far. The state has been averaging a 1 percent reduction in greenhouse gas emissions annually. That pace is projected to continue through 2020, and is enough to meet the 2020 reduction goal. But residents and businesses will be hit harder after that. Emissions will need to be reduced by at least 5.2 percent annually from 2020 to 2030 in order to meet the 2030 target. “This gives an indication of the challenge of the work that we have ahead of us in the scoping plan to develop an approach, to develop a set of measures that can contribute to and achieve this ambitious greenhouse gas reduction level for 2030,” said ARB Assistant Executive Officer Michael Gibbs. An analysis of the economic impacts of the climate change regulations will be conducted as a part of the scoping plan. No cost estimates were provided at the workshop, but several officials in addition to Brown said that billions of dollars in increased funding will be required. Regional workshops on the scoping plan will be held this fall; the Air Resources Board will receive an update on Nov. 19. The draft plan is scheduled to be released in spring 2016. The final plan is expected to be approved in fall 2016.